Los Angeles first came together in 2007 for their self-titled debut album. The backbone of the project was singer Michele Luppi (Vision Divine) and bassist/producer Fabrizio Grossi (Glenn Hughes, From the Inside, Vertigo). 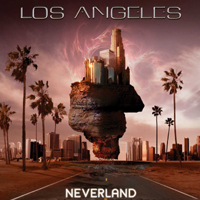 Now 2010 and the same two are back with "Neverland". The sound on "Neverland" is dominated by Luppi's vocie which in parts gets very annoying, mainly because of his strong Italian accent. The music is what you would expect from Tommy Denander very fluffy AOR with no balls or punch, Not even guest apprences from (John Sykes & George Lynch) pull this out of the hole, sounds very computerize to my ears with no soul or meaning. Michele tackels a cover of the Richard Marx track "Nothing To Hide". Unfortuantly this is where you can hear Luppi's limitations. Doesn't even come close to the origanal if that's what he was trying to achive. All in all not a bad album, there are some great tracks on here like "Neverland", City of Angels", & "Promises", but there is better stuff out there for your money, unless you want mindless numb AOR!!!!!!!!!! !